PENANG Free WiFi (PFW), the free wifi service by the state government, will be temporarily discontinued for service upgrading work, state Works Committee chairman Zairil Khir Johari (pic) said. The services will be discontinued indefinitely from Feb 12 until further notice. He said the state had on Dec 12 last year made the decision to have the PFW stopped temporarily after a survey found that its services were far from satisfactory. “There were a high number of complaints on the WiFi services and the cost to maintain did not commensurate with the quality of its services. “The state believes PFW should provide higher standard of quality in the quest to make Penang an international smart city under the Penang 2030 vision,” said Zairil during a press conference in Bayan Lepas yesterday. “As such, the state government has decided to rebrand the services with a Request For Proposal (RFP) for creative and innovative ideas from companies involved in telecommunication infrastructure,” he added. 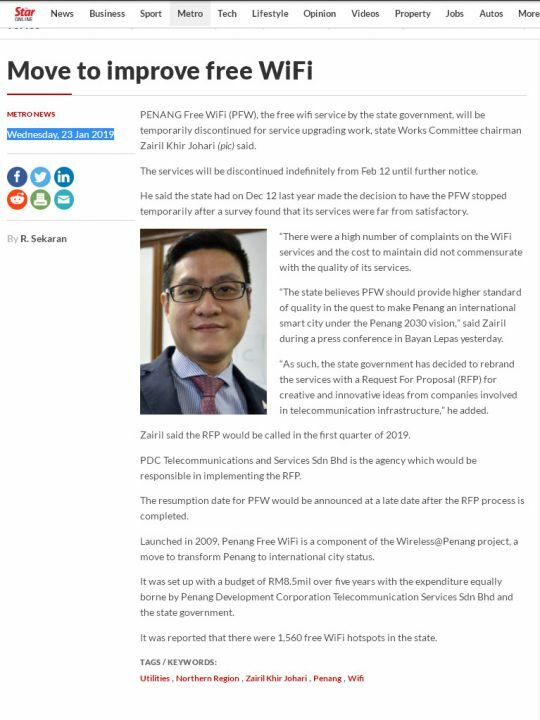 Zairil said the RFP would be called in the first quarter of 2019. PDC Telecommunications and Services Sdn Bhd is the agency which would be responsible in implementing the RFP. The resumption date for PFW would be announced at a late date after the RFP process is completed. Launched in 2009, Penang Free WiFi is a component of the Wireless@Penang project, a move to transform Penang to international city status. It was set up with a budget of RM8.5mil over five years with the expenditure equally borne by Penang Development Corporation Telecommunication Services Sdn Bhd and the state government. It was reported that there were 1,560 free WiFi hotspots in the state.